Hi, regarding the feature that buffs magicka related enchantments on robes, does the buff only work on actual robes? Or does the buff apply to every type of clothing item? Much like the Mage Armor perk. Only magic robes, so items listed here with the exception of the "Emperor's Robes" and the "Ragged Robes". If you can use the CK or SSEEdit, you can add or remove items on formlist "EnAdRobesFormList [FLST:xx0D5252]". Thanks for clarifying and for the prompt response. 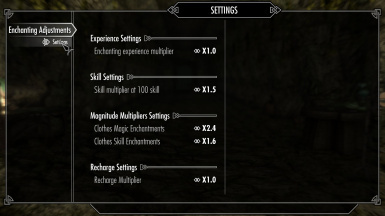 After reading through the description page of your mod, I saw the fix you made to double enchantments like magicka - magicka regen and the chaos enchant, I was wondering however, does that fix also affect the Fiery Soul Trap enchant? I'm asking since the enchant suffers from the same issues as the others, when learned and applied, only one of the two effects is improved (Soul trap) Some mods address this by changing the enchant so the fire portion of the enchant is the one improved and I just wanted to know if your mod affected FST in any way. Excellent mod by the way, keep up the good work! Yes, my mod makes sure it's the fire damage effect that scales while the soul trap stays the same. I think this enchantment is from a unique weapon so I could have made it non disenchentable and gotten rid of the problem that way. But I figured that since the soul trap effect remains useful even at low durations and that the description of the enchantment indicates clearly which effect scales (contrary to the Chaos enchantment) it would be fine like this. Is it not possible to show the charges and prices from the beginning (before enchanting)? Yes it is, in the enchanting UI, before confirming the enchantment. It is safe if I use "Price Bug Fix Only" in SLE? The values are not seen in the enchanting ui, but the change is noticeable when leaving it. "It is safe if I use "Price Bug Fix Only" in SLE?" I'm not sure of the consequences of running a form 44 .esp on SLE. You can try but don't be surprised if your saves become corrupted and whatnot. You can also try to backport it but I'm unsure how. "The values are not seen in the enchanting ui, but the change is noticeable when leaving it." Yes the complete version has a script that fixes the prices and charges values in the enchanting UI but the price bug fix only version does not. Magnitude values are always correct and so are all values shown in the inventory. So far it works correctly, but I'll be careful. Good to see you're updating this one, again. :D New features are looking interesting. Nice job. Especially hyped to find a great enchanted sword at the end of a dungeon, and have the option of actually using it more than a half dozen times. Great little quality of life feature to coincide with the level-scaling rebalance. Yes, with V2.0, looted and player enchanted weapons will have approximately three times more uses before being depleted. Any ballpark ETA for 2.0? I'm hoping to release this week. After looking through SSEedit, I noticed there were a ot of conflicts with WACCF. Will you be making a patch for this mod or do you think it's fine for this mod to overwrite it? I will, it's planned to be released with 2.0. Should be fine. The only thing my mod does is change the enchantment you learn when disenchanting looted chaos weapons. Just to be clear, this also fixes the charges depleting more quickly after reloading bug thingy, right? The weapons depleting more quickly after reloading the game is actually the root of the price bug. With this mod, the charges and the price do not change anymore, but that also means that weapons will have less charges than what you may be used to without the bug fix. I will change that so crafted and looted weapons have more charges in V2.0 which should come soon™. How do you plan to go about doing this without a SKSE plugin? 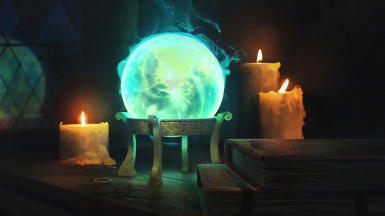 Honestly, if the charges are linked to the values of enchantments, then I doubt many would object to an across-the-board nerf to the enchantment values since it's one of the easiest get-rich gimmicks in the game. It would also go hand-in-hand with your economy mod, which I also use. I did it by lowering the base cost of enchantments magic effects, and fiddling with games settings to compensate the gold value. 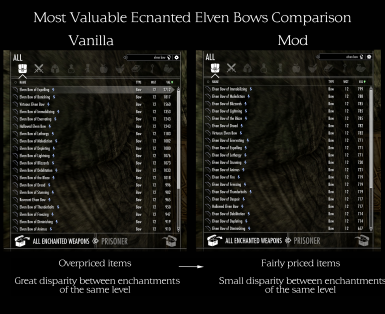 V1.x already lowered the value of enchanted items (see images), but that's one of the points of the mod: to fix the get rich schemes. You can see here most of loot enchanted weapons have around 50 uses, which is too low for most people. 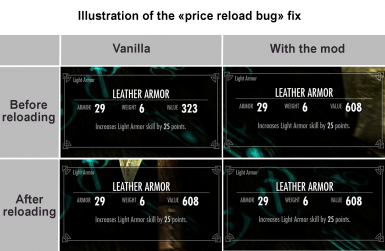 The price bug fix cause the same problem for player enchanted weapons. That will be fixed. 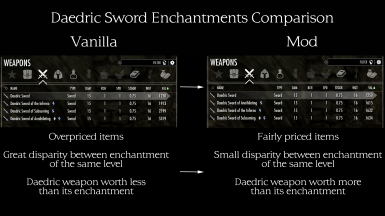 So with V2.0, enchantments have more or less the same value than in V1.x (400 gold + base weapon value for enchantments with all perks and skills), but items will have about 3x more uses. So around 150-200 uses when enchanted with a grand soul gem for both looted and player enchanted weapons. I will publish details and formulas used by the game when I publish V2.0. Hi, I'm trying to chase down a bug where I cannot disenchant weapons of "Chaos" to get the chaos damage enchantment in my repertoire. Your description of the mod says it changes the Chaos damage but I don't quite understand what you mean when you say "mentioned above". Does the mod make it so you can't disenchant chaos weapons? When I try my game just says "You already know that enchantment". Yes, when disenchanting a chaos enchanted weapon with this mod, you learn shock damage. This is because chaos weapons enchanted by the player are completely bugged. Would it be possible for you to release a version of this that contains only the enchantment tweaks? I'm not sure off the top of my head how this would interact with the SKSE plugin. I'm working on V2.0 right now, so I'll take a look. I'm really unsure of what happens when the two mods are loaded together. However, I'm not even sure making a enchantments tweaks only version makes sense because "Enchantment Reload Fix" (SE version or not) makes the pricing of enchanted items completely incoherent (price go down when enchantment magnitude goes up). I would gladly use "Enchanting Adjustments and Price Bug Fix 1.2 SSE" with the summermyst patch but I have to use the "only" version instead because of missing dependencies. Is it possible for you to release a version where I can use your adjustment and price bug fix with Summermyst together? You can load both versions and let the complete one overwrite the bug fix only" one and load the patch. However, you're going to have balancing issues because the complete version rebalance vanilla enchantments but not Summermyst's.